“Let’s get ready for Duuuuummbbbo,” is an actual line said by the legendary boxing announcer Michael Buffer and reader, I, was not ready for Dumbo. 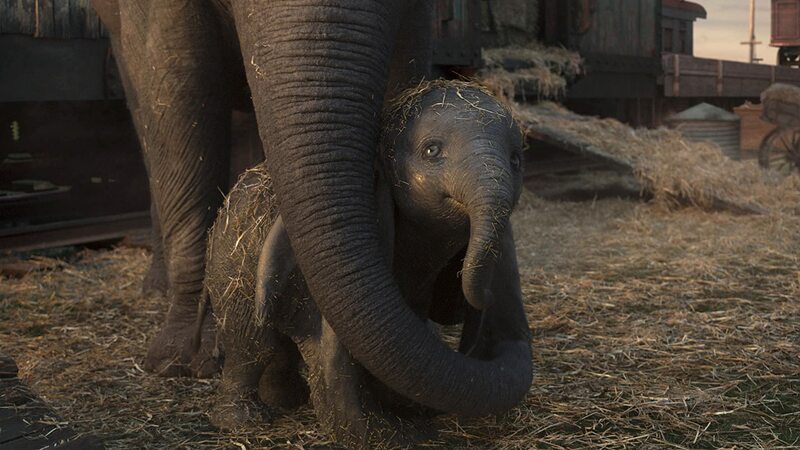 Directed by Tim Burton, Dumbo is a live-action adaptation of the 1941 animated classic and the first Disney remake to be released in 2019. The film stars Colin Farrell, Nico Parker, Finley Hobbins, Eva Green, Danny Devito, and Michael Keaton. First thing first, we’ve got to address the elephant in the room, and it’s not Dumbo, it’s Disney for getting rid of the racist crows that were in the 1941 movie. For an adaptation made for a 21st century audience, there were other changes that were made, which included a more realistic approach and a film without anthropomorphic animals. The original cartoon had Dumbo befriend an anthropomorphic mouse named Timothy Q. Mouse which parodied the stereotypical relationship of animosity between elephants and mice. With all that being said, this live-action adaptation of a movie about a flying elephant tries to be as realistic as possible and relies on the humans to carry the film. The problem with these characters is that they are dead on arrival. The dialogue is just used to push the story forward and everything about these characters is forgettable. 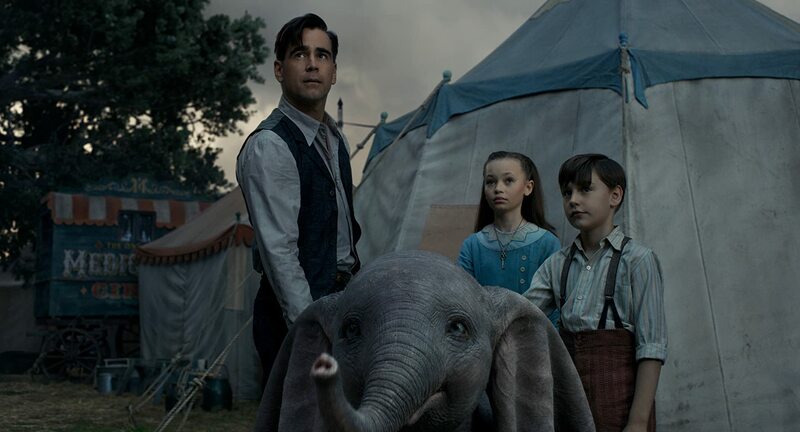 Pictured from left to right: Holt Farrier (Colin Farrell), Milly Farrier (Nico Parker), Joe Farrier (Finley Hobbins) and Dumbo (center). When Holt Farrier (Colin Farrell) returns to the Medici Bros. Circus after World War I, he is tasked with taking care of Jumbo Jr., nicknamed Dumbo, a newborn elephant with giant ears. Holt lost his right arm in WWI and his two children, Milly Farrier (Nico Parker) and Joe Farrier (Finley Hobbins), are apprehensive when reuniting with him for the first time. Their mother has passed away, their father has lost an arm, and they’re raising a deformed elephant which is all the elements for a touching story about a family coming together through adversity. The movie never does that. Dumbo and Holt Farrier had a deformity and there was never a scene where the pair had a heartfelt moment. The closest we get to these characters bonding is Holt telling Dumbo to fly in the most truly uninspired way possible. This moment happens near the end of the film and after spending the whole film with these characters, there wasn’t a reason to care. Acting wise, Colin Farrell does a fine job but the script is what buries his performance in the movie. I really wanted to care about these characters but the film never gave a reason to. The two child actors have a big role in the film and Tim Burton fails to get the most out of them. Nico Parker’s delivery was stiff throughout the film and Finley Hobbins wasn’t given much of anything to do but cheer for Dumbo. The lack of direction doesn’t stop at the kids, Eva Green who plays Collette Merchant, suffers the same fate. Merchant was just there to deliver the exposition and to eventually become Holt Farrier’s love interest by the end of the film. Her personality and motivations have barely developed throughout the film and she only ends up siding with Dumbo because her boss does not believe in a safe work environment. 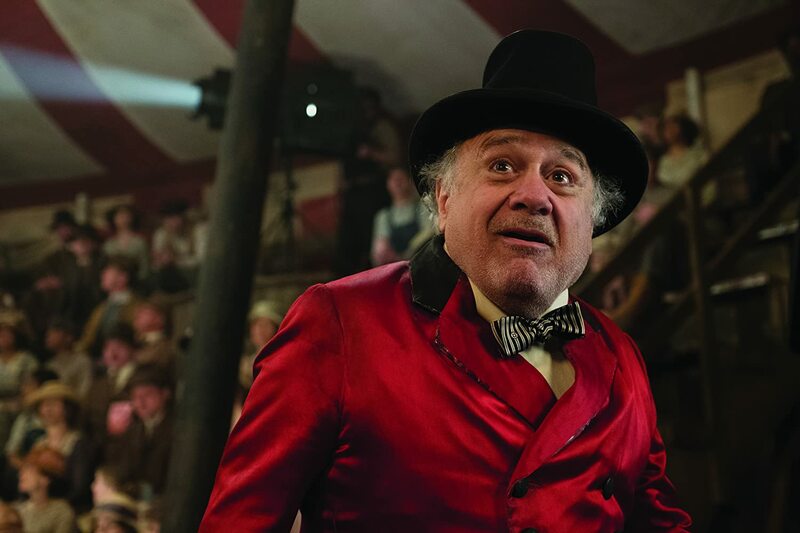 Max Medici (Danny Devito) watches in astonishment as Dumbo performs his routine for the first time. The only human character that captures the essence of the film is Max Medici played by Danny Devito. Max Medici is the owner of a small troop circus called Medici Bros. Circus, no explanation for what happened to the other Medici brothers, and he’s the owner of Dumbo and his mom. When Medici sees the large ears on Dumbo he is distraught because the baby elephant is deformed and a freak show. He makes an offhand comment about how he already has enough freaks because he runs the circus. Devito’s role is that eventually he grows to love Dumbo by the end of the film. 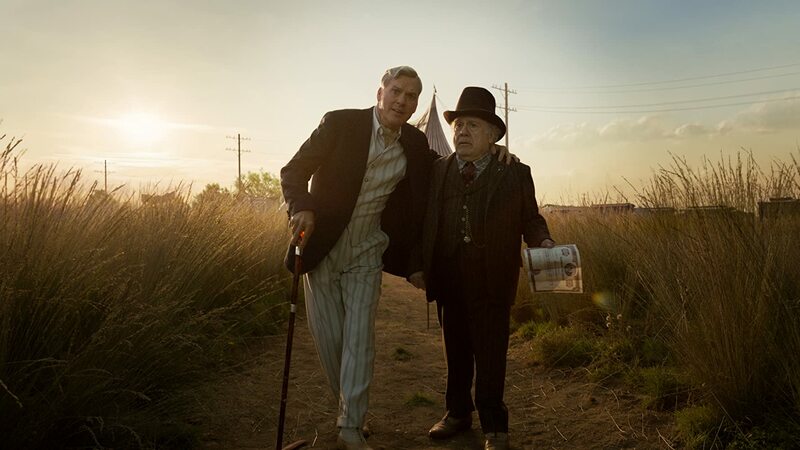 In Devito’s scenes he delivers a sense of magic that is acquiescent to Gene Wilder as Willy Wonka. Danny Devito isn’t the only actor to reunite with Tim Burton in this film, Batman returns as Michael Keaton portrays the exploitive entrepreneur, V.A. Vandevere. Vandevere is the owner of Dreamland, an amusement park, and he buys Medici Bros. Circus just so he can exploit Dumbo for financial gain. He runs Dreamland like a nightmare and abuses his animals, employees and so when gets his comeuppance at the end of the film, it’s a satisfying ending. Vandevere’s cruelty knows no end and there is a scene that effectively shows this when he makes his trapeze artist Colette Merchant perform without a safety net. Performance wise, I am not sure what Michael Keaton thought he was trying to accomplish. Throughout the film, Keaton lays the craziness on thick and talks with multiple accents throughout the film. In one scene he’s southern American, the next scene he’s British and then he’s Australian, and it was jarring, not sure what he was thinking but he came off as goofy. He tries to be quirky but instead he makes his character feel forced and awkward. The executives at Disney may have been looking for this type of wonky Johnny Depp type of portrayal, but this was definitely not Jack Sparrow and it ended up hindering the film to the point that it takes you out of the movie. Dumbo is enjoying a well-earned bath. Enough about these humans, what about the the flying elephant, the film’s titular character? This film focuses too much on the humans and not enough on Dumbo. Dumbo takes a backseat to Michael Keaton being goofy and stiff child actors. The fact that this movie is nearly double the length of the 1941 cartoon yet there isn’t any meaningful development in his character and it’s a shame. The scenes between Dumbo and his mom are the most emotional moments in the film. Dumbo NEEDS MORE Dumbo. 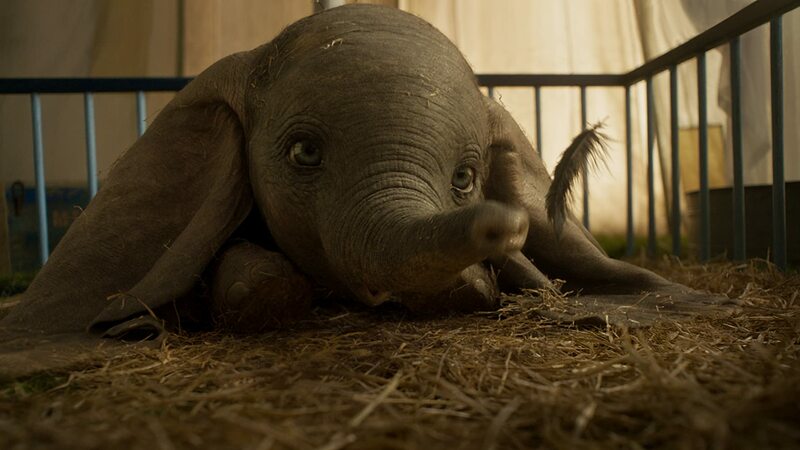 The animation of Dumbo is stunning and his big blue eyes convey various expressions throughout the film. He doesn’t speak but he can understand everything that the humans tell him. The most realistic aspect of this film is when Dumbo is put into peculiar situations and you can actually see the fear on his face. If only he felt as important as his name suggest that he is on the film’s title card. The animation team did a phenomenal job at making him look like a star. When the elephant with jumbo-sized ears finally realizes that he can fly without the use of a feather, it doesn’t feel special in the context of the film. The animation of Dumbo is superb and his reaction, especially his eyes, has this sense of amazement. However, when the Farriers tell him that he can fly without it during a tense moment in the film, their delivery falls flat. This creates a scene with an emotional elephant with a family of humans in a circus tent surrounded in an inferno in a dire situation but the humans do not seem to care that they may die. Like Milly Farrier’s delivery…. There. Was. No. Emotion. Outside of the titular character and his animation, the visual aspects of this film were all-around stunning. There were times where the green screen was obvious but those were few and far between. The set pieces and the CGI for Dreamland were vibrant and full of life. Tim Burton uses a filter throughout the film that gives it a dusk feeling that remincises an era that’s fittingly long gone. It’s early in 2019 but Dumbo has some of the best costume designs so far this year. The crew behind the scenes put in work from the makeup to the set pieces, everything has a grandiose quality to it. The visuals are the soul in a film that felt like it was made without a heart. 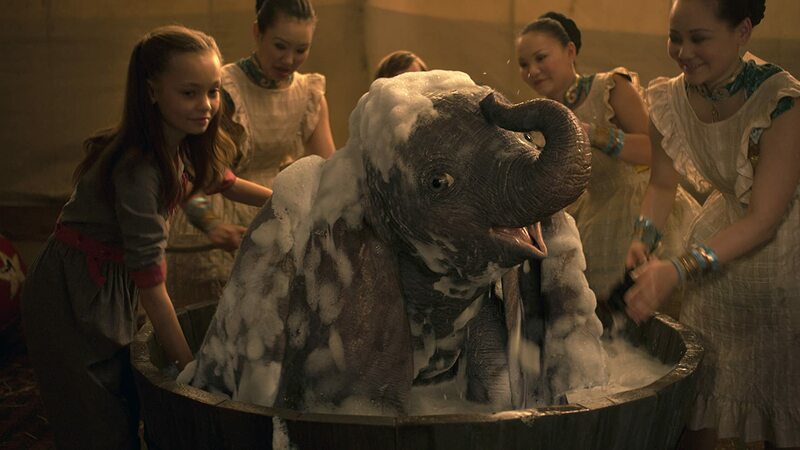 It’s easy to see that there was a lot of thought and imagination when creating this magical world for Dumbo and hopefully, in time, this film will get its recognition for that. There are homages to the 1941 classic, including a creative recreation of the “Pink Elephants on Parade” scene. 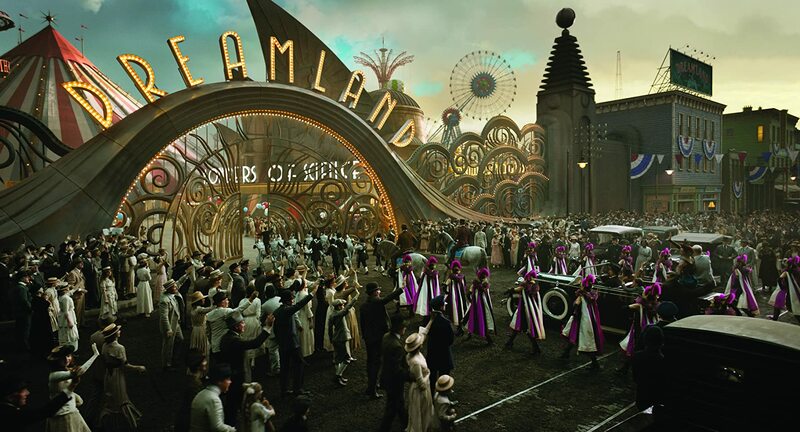 In 2019, Disney is not going to allow an elephant to get drunk on the big screen and the film did a solid job at getting around this while maintaining the psychadelic effect. There’s a great homage to the Pink Elephants on Parade scene. 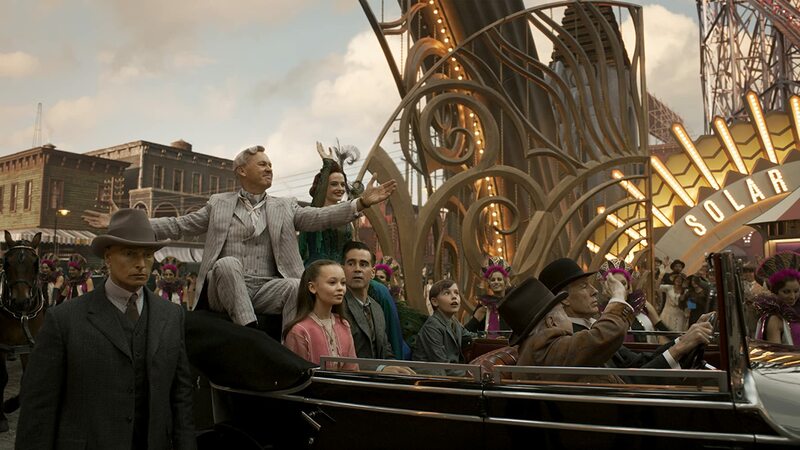 Seventy-eight years in the making and we finally received the highly anticipated and long-awaited live-action remake of Dumbo and the flying elephant deserved better than this cash grab of a film. The original Dumbo was the second Disney film to turn a profit and was culturally, historically, or aesthetically significant enough to be registered in the United States National Film Registry in 2017 by the Library of Congress. Dumbo is supposed to tell the story of how one overcomes self-doubt and overcomes the adversity and ridicule from others. This version has the ingredients to tell that story but doesn’t even try to. Each human character has a flaw or deformity that matches Dumbo’s physical deformity with his jumbo sized ears, yet Tim Burton’s film never capitalizes off of that to create any type of emotional attachment with the characters. Disney tried to reinvent their classic by creating new characters and making a movie about a flying elephant realistic, that’s a jumbo task to execute. What makes things worse is that this movie should’ve been at least 30 minutes shorter. The script doesn’t have much depth to it so it wears itself thin amongst its runtime. The animation, costume design and production are extraordinary and beautiful to watch but since the film doesn’t pack a punch it makes the end result forgettable. Hopefully, the next two Disney remakes to be released in 2019 will live up to their original classics. If not, 2019 is going to be longer than Dumbo’s trunk. Check this one out when it comes to a VOD or a rental service. Dumbo was released in theaters March 29, 2019.